» 520 Fresh Pipes » 78 Other Arrivals » Subscribe FREE Shipping on all US orders over $95 | When Will My Package Ship? 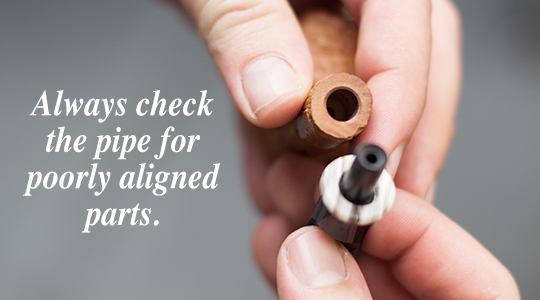 Selecting a pipe is a subtly complex exercise. If you have been in a pipe shop and watched someone buy a pipe, you may have wondered what was taking so long. There are myriad factors that go into finding and buying the right pipe for yourself, and even more so in choosing a pipe as a gift. Unfortunately, very little has been written about how to buy your first (or second, or third) pipe. This guide will examine the factors involved in choosing a pipe for yourself, and will hopefully alleviate some of the perplexing questions beginning pipe smokers have. A separate guide Choosing Gifts for Pipe Smokers examines the extra steps involved in buying a pipe as a gift for someone else. A pipe must meet several requirements in order to satisfy you. They can be roughly divided into the following categories: Aesthetic, Mechanical, and Financial. Let's examine each of them, in order of importance. If you keep these three factors in mind, you'll walk away with the knowledge and confidence to select a well-made pipe that appeals to you, that you can afford, and that will provide you with years of smoking enjoyment. 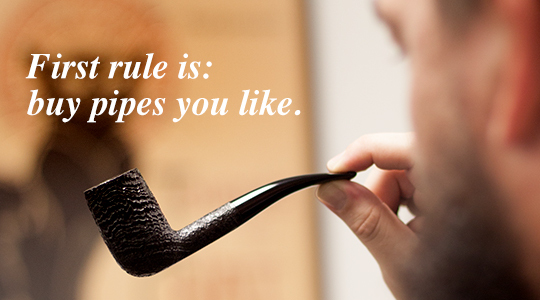 You must enjoy the look and feel of the pipe. All other considerations pale in comparison to this one. It will not matter if you have purchased a mechanically flawless pipe at an insanely good price if, in a few weeks or months, you find that you do not smoke it any longer because it is not your style. It doesn't matter if a pipe is crafted by a big-name carver or a well-known factory; if it does not appeal to you, then it is not a good candidate for purchase. So, the first rule is: Buy pipes you like. Pretty easy so far, right? Well, how do you know what you like? If you are new to pipe smoking, you may not be entirely sure of what types of pipes suit you best, or excite you most. The best advice in that case is to look at pipes. Look at lots of pipes. Take every opportunity to check out interesting selections. Look at all of the different pipe styles. Sooner or later (probably sooner), a pipe is going to reach out and take hold of you and whisper quietly to you 'take me home.' When this happens, you must be prepared to move on to the next aspect of pipe buying, the physical inspection. The pipe must be constructed in such a manner as to bring you pleasure from smoking it. It must not have design flaws that cause it to be impossible to keep clean, lit, or even together. The question, especially for beginning pipe smokers, is how to tell if a pipe is well made. You need to know, then, what to look for in both a well-made, and a shoddily made pipe, so that you can tell the difference, and buy only those pipes that are well made. First and foremost, a list of things to avoid. The presence of any one of the following should not be a cause for great concern; however, a pipe that has more than a few of these attributes might be one to take a pass on. Poorly aligned parts - quality pipes have a precisely aligned and perfectly smooth airway from the draft hole in the bowl to the end of the mouthpiece. Any disruption in the smokestream (such as a misaligned mortise and tenon union) is going to cause turbulence and can cause the pipe to smoke loudly and wet. Be aware that some pipes are purposely designed with some type of moisture 'trap' that does work well for some people. 'Fills' - large holes or pits in the pipe, filled in with putty. While these may not interfere with the actual smoking of the pipe, they may not color and age as gracefully as the rest of the briar and could cause a mottled appearance of the pipe. Briar is a natural product, and you may not know how deep a fill actually is. Metal filters - these inserts in the stems of some pipes will cause condensation, resulting in a noisy, wet smoke. Varnish - pipe makers at all different levels use a dizzying array of finishes on their pipes. While most finishes will have no effect on a pipe, other than how long it stays shiny, it's best to avoid varnished finishes or 'sealed' finishes because they might tend to flake or bubble. There are always exceptions to every rule, and there are some very well made pipes that use heavy finishes and are quite desirable, smokable, and collectible. Grain: The more uniform the grain, and the tighter the grain, the higher the price of the pipe, but overall, this has little to no effect on the smoking quality. Weight: The lighter a pipe is, everything else being equal, the better it will smoke. Okay, that's a pretty bold statement. The truth of the matter is that a lot of folks are looking for a pipe that 'feels lighter than it should'. A lighter pipe is easier to hold in your mouth and therefore less fatiguing. A pipe that is light for its size may also have been cured more thoroughly (moisture removal). Sandpits: Sandpits happen, and there really isn't anything wrong with them, but the fewer of them in a pipe, the better. 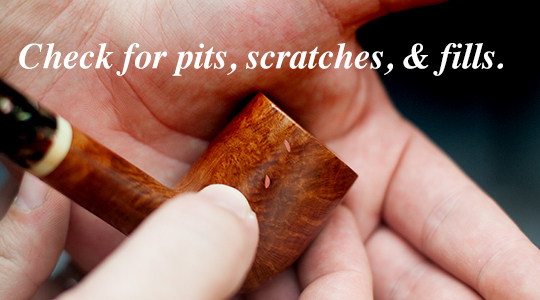 Fit and finish: The pipe should look as if it was made with care. There should not be any obvious sandpaper marks, uneven stain, or bald spots without wax. The inside of the bowl should not be stained. The stem and shank should join well. Draft hole: This should be as close as possible to the center of the bowl, and should align perfectly with the airhole in the stem. It should also terminate at the bottom of the bowl, not partway up the side. The good news is that we've done a lot of the hard work for you here, as every pipe we sell has been thoroughly inspected. 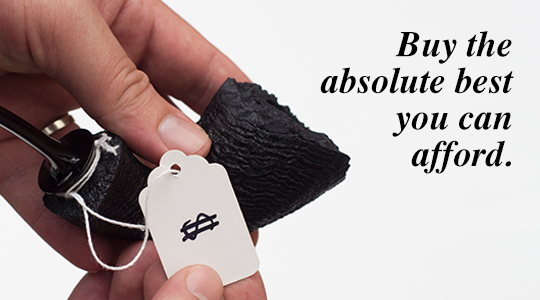 Buy the absolute best you can afford. This is the basic financial rule of pipe purchasing, and of almost any other purchase. Pipes are available in a vast range of prices, from under $20.00 to well into the $1,000's, with plenty of well-made pipes in each price category. You should strive to get the greatest value for your money. The reason this is the final consideration is that pipes are not cheap or expensive; they are either good smokers, or bad smokers, and without careful consideration of the aesthetics and mechanics, a cheap pipe and an expensive pipe are equally likely to be a good smoker or a bad one. Having read and applied the principles above, you should have a good foundation of knowledge to apply to your pipe purchasing, and you should have figured out why it takes so long to pick out a pipe!